14 pp. Roman, 272 pp. EKoti is the name of the Bantu language (P.311) which is spoken by the Koti people on Koti Island and on the mainlaind directly across the island, in Angoche, the capital of the district of the same name, in the province of Nampula, Mozambique. EKoti is spoken by a small but growing number of people, with a number of speakers of 64,200 in 1997, as compared to 30,000 in the 1960s. The co-author of this grammar, the linguist Francisco Ussene Mucanheia, is himself a native speaker of this language. EKoti is a mixed language which originally developed from a southern Swahili dialect but has been significantly influenced in its structure by Makua, a dialect belonging to the Makhuwa group. Thus, EKoti is neither a dialect of Makua (P.30) nor a dialect of Swahili (G.40). The term Maka, used in the sub-title of this book, refers to the cultural and historical identity of the people of Angoche who call themselves the Maka. 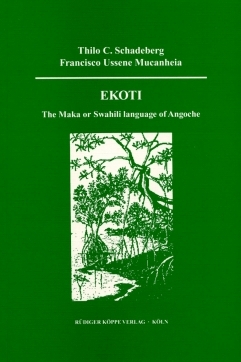 This grammar of EKoti is divided into two sections: The first part consists of an introduction to the history and classification of the language, and of a comprehensive grammar with chapters on phonology, the morphology of nouns, adjectives, pronouns and numerals, verbal morphology, the use of tense, aspect and mood, and predication. The second part comprises a collection of EKoti texts with interlinear translations into English, and an extensive EKoti–English, English–EKoti vocabulary with approximately 1,600 entries. This work is assigned for linguists and students of African languages. At the same time it is indirectly involved in the discussion concerning the fate of minority languages in Africa, since Ekoti speakers, about 64,000 in number (1997), compose only a diminutive part of Mozambique’s population, comprising 18 mln inhabitants.